Nu Hair Clinic is part of the internationally renown Nu Cosmetic Group. Nu is a name tantamount to excellence, innovation and integrity. The Nu group has over 25 years team experience in providing first class cosmetic surgery and aesthetic treatments. 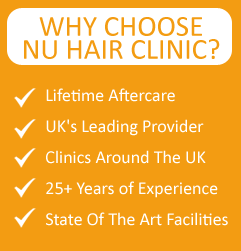 At Nu Hair Clinic, we only use fully registered, experienced cosmetic surgeons and doctors for all of our surgery meaning you get the very best aesthetic outcomes from your treatments as well as clinically excellent care. At Nu, we believe in putting the client first in everything we do, we believe in being open, honest and clear in all our communications so that you know that Nu is a name you can trust. And don’t just take our word for it, here are just some of the comments from a few of our 10,000 satisfied clients.